The following group types are not accepted by this hostel: Junior / Primary School, College / University, Stag/Hen/Bachelor Party, Sports Group, Cultural Group If you have misrepresented the type of group you are booking for, your booking may be cancelled by the hostel." Enjoy a friendly atmosphere and a great service in our hotel which is located in the central of downtown Cairo. We will also provide you with all information you might need for your travel around Egypt in addition to a free map of Cairo. Just 5 minutes away from the Egyptian museum. The hostel is very well located, near 2 metro lines and in an avenue that has everything near you. Its very clean and has nice decoration. Staff very helpful. The staff here are super helpful! Thank you so much for a great stay! Really an amazing hostel in Downtown Cairo. Lovely rooms, super clean, tasty breakfast, and the best staff you could hope for - everyone was so kind and helpful! I stayed at this hostel twice while travelling in Egypt, and wouldn't consider anywhere else. Thank you so much to everyone for an incredible stay. Amazing people and staff...made great friends and had a cool party...and special thanks to abdullah for the amazing atmosphere and the parties...will surely be back to meet my friend. Memorable time..!! Great hostel with a great location in downtown cairo. 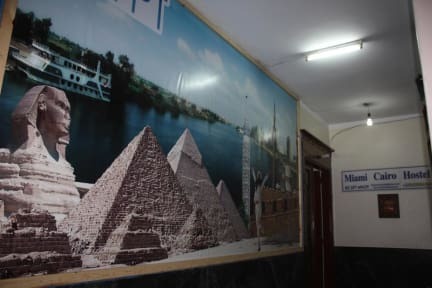 The hostel was very clean and the staff gave great advice on things to do in both cairo and egypt. I stayed one day and after seeing the place, how clean it is and how nice the staff behaved (shaeka), I came back, also recommended it to more friends. The beds in the dorm have their own private spaces with light and chargers, breakfast is good and the staff is always making sure you are comfortable. Great staff and great location. Definitely value for money. Would come back and stay here again! The staff members were friendly and very helpful. Amazing and friendly staff which I living in a sharing dorm which water heater was faulty,they relocate me to other triple sharing room without charges any fees,which I really felt appreciated.